Cultural historian Hutton (History/Univ. of New Mexico; Phil Sheridan and His Army, 1985, etc.) presents the sorry history of white America's persecution of the ferocious tribe that consistently returned their ill treatment measure for measure. The story can be quickly summarized. In the early 1860s, a band of reservation Apaches was infuriated by yet another venal betrayal by genocidal white authorities. Under a series of leaders, they slipped away to roam the canyons of Arizona and New and Old Mexico, stealing livestock and gruesomely torturing and killing settlers. 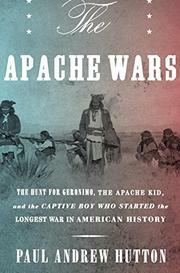 The U.S. Army pursued them, both sides suffered casualties, and the surviving Apaches, weary of the chase, surrendered to return to the reservation. Repeat periodically for 35 years until much of the tribe was exiled to Oklahoma. Felix Ward, the Irish/Mexican "captive boy" later known as Mickey Free, is the thread that runs throughout the narrative. Raised as an Apache, he spent much of his adult life working as a reservation policeman and scout for the Army, in which capacities he appears during much of this history without disclosing any sense of his personality. This is equally true of Hutton's vast cast of characters—native, Hispanic, and Anglo—who largely fail to emerge as distinct individuals. The accounts of armed conflict are stirringly told and often read like a Western thriller, but there are too many, with no sense of proportion; it seems there is no raid, patrol, or skirmish too minor to draw Hutton's attention. Furthermore, the author explains little of the culture of the geographically fragmented Apache people. The narrative unfolds almost entirely from an Anglo perspective, but very few individuals of any ethnicity emerge in a favorable light, with the possible exception of those Apaches who wished only to live quietly in whatever wasteland the whites most recently assigned to them. A thoroughly researched but plodding account of the clash of two implacably incompatible cultures.